29 mm. 6:30. 8.59 grams. Very close to official style. Could this be official, although light weight? Prototype: RIC Tiberius 81, "weight peaks 11.5 - 10.0 grams, dies mainly 12:00"
B&S VI, pp.87-100. This piece has letters very slightly irregular, but it is much nicer than any of the 13 imitations pictured on pages 98-99. Ex Vecchi auction 12, lot 1092. Official DIVVS AVGVSTVS PATER/PROVIDENT, altar. Prototype of the above coin, and of the reverse of the next. 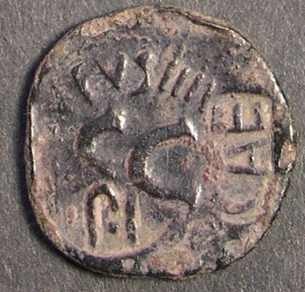 RIC 81 "c. AD 22/23 - ? 30" under Tiberius. "Asses c. 11.5 - 10.0 grams." B&S Volume VI, pages 87-100. SC surrounded by RVFVS IIII --- with two countermarks. 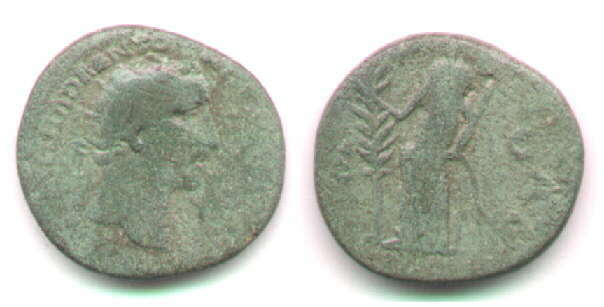 The coin appears to be an imitation of an as struck by C. Plotius Rufus, dated 23 BC. 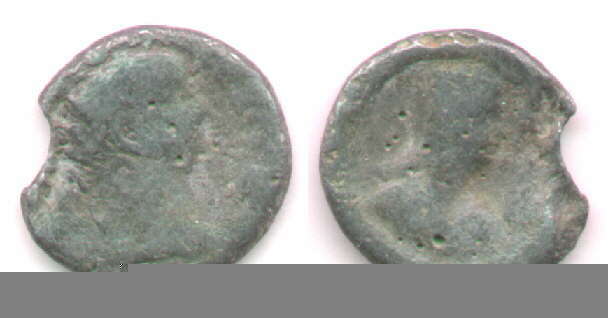 BMC Augustus has imitations of this obverse (which would be 150, plate 19.3). Countermarks are listed p.xxxii-xliii and neither is listed. The CAE countermark is identifed as of Tiberius. I don't know what this one is supposed to be. For imitations of types of Claudius (AD 41-54), see here. Imitation: AE24. 6:00. 6.12 grams. Cast, with an edge seam. Weak relief. Heavily patinated. This prototype: AE26-25. 6:00. 10.17 grams. Prototype: RIC 312, BMC 244. Sear 690 var. Imitation: lead 24. 12:00. 13.91 grams. This prototype: Billon 27-24. 12:00. 13.00 grams. Prototype year 10, AD 63/64. Cast imitation in lead. Casting bubbles evident, and the arc from the side 9:00/3:00 is from the casting channel. This piece might be very worn, but, more probably, did not have much detail to begin with. /approximation to PONTIF MAX - TRP IMP PP usually on a flan 2-3 mm larger. A type of AD 84. This is a full-size imitation in yellow metal. The obverse legend is almost complete while the reverse is retrograde. It came with an old British ticket and may have been found in England. 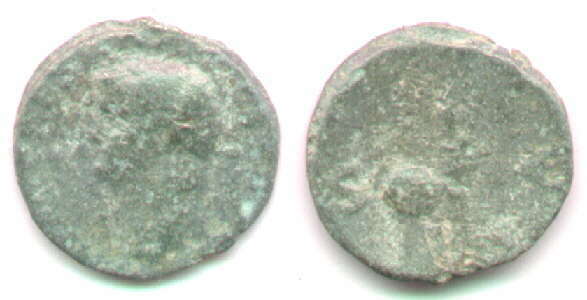 Weakly struck imitation dupondius (the crown is radiate). 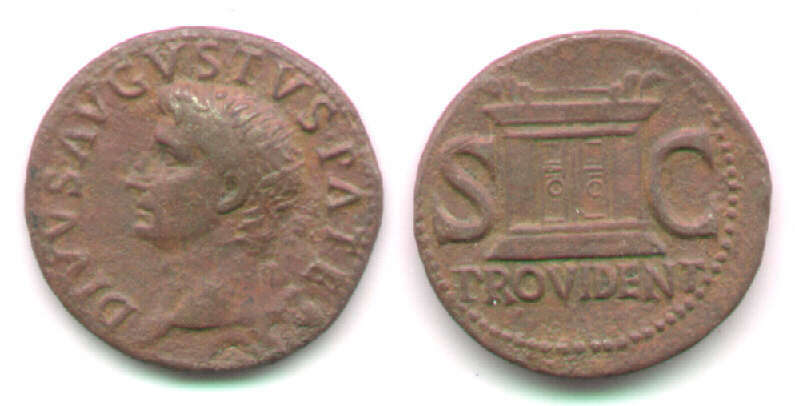 Radiate head of Trajan right, with many small letters, illegible. /in exergue, S C with "S" highly irregular. This is not a "limes-falsa" as defined by Boon, because it is not a cast and it is heavy weight. He suggests heavy weight casts are of the Antonine period, but this is not a cast (in spite of the large number of tiny pits). Clearly, it is not cast from an offical coin. 11.41 grams is full weight. The prototype was struck 145-161 according to BMC, and in 146 according to Hill. References: Boon, "Light-weights..." NC 1965, pages 167-8 says these heavy casts are not what are known as "light weights". Prototype: Hill 702. BMC 1742. RIC 808. 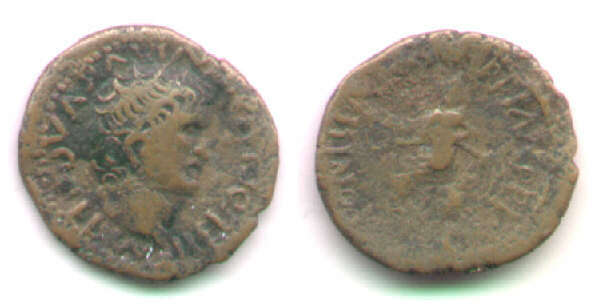 Hill (p. 193) thinks the type may commemorate the adoption of Marcus. However, he dates the prototype to 144. References: Nothing similar in Boon. 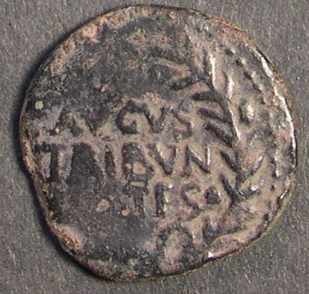 Mabbott 4673 has one of Lucius verus "of Danubian origin." 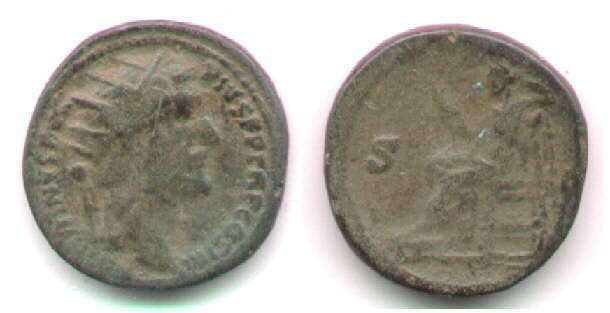 FMRZ Lux I, plate III.316 is a crude "sestertius" of A.P. 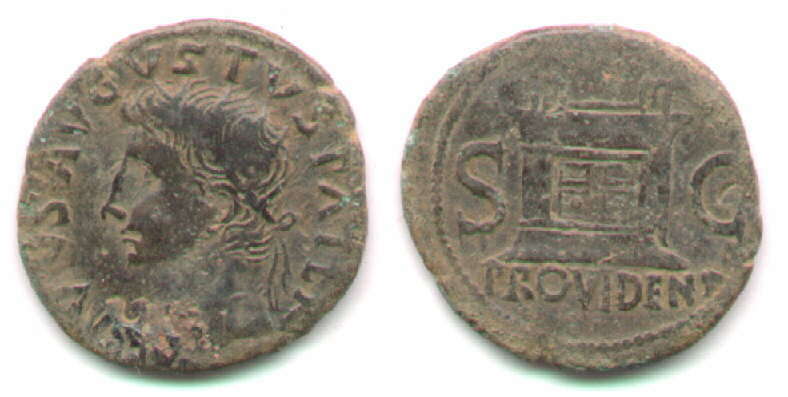 Continue with the next page, Severan (and later) fourrés from the Balkans. 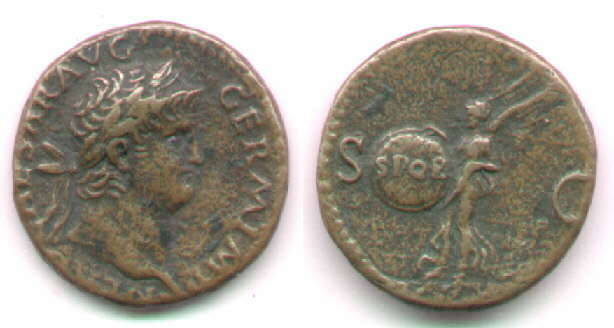 Go to the page on types of Claudius struck in Britain and other early AE imitations. 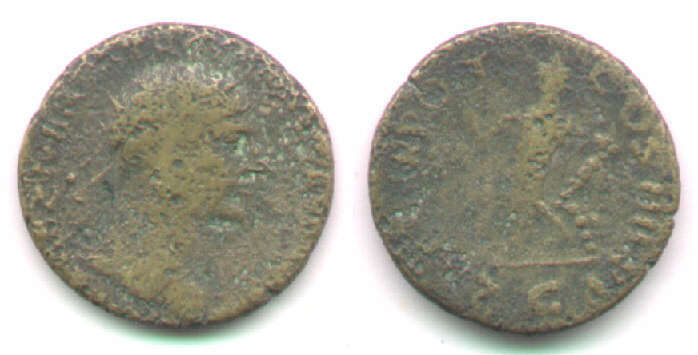 Go to the page on first-century silver imitations.